To “angularize” the app, I thought it would be nice and illustrative to componentize the three basic menu items with routes and components. So, let’s jump right in. 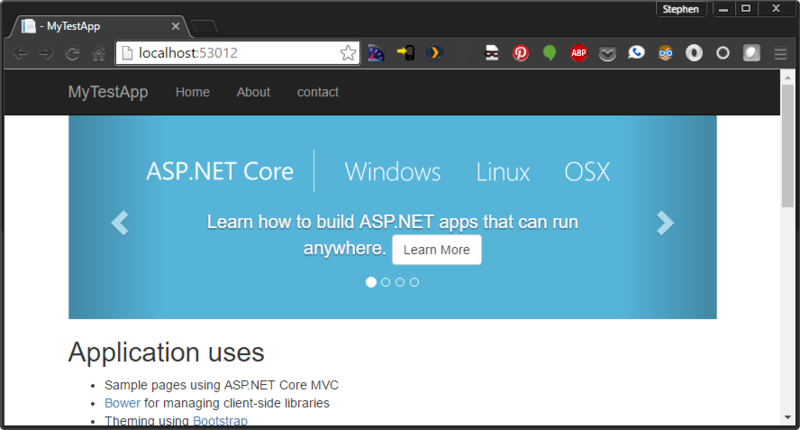 The main component’s template now will own the menu navigation links. Basically, all I have done is hacked apart the original _Layout.cshtml and Index.cshtml to split things apart. The MainComponent.cshtml will now look like the below template. You can see that the primary change is to specifify our router links and define the special “router-outlet” HTML element. Angular2 uses this element to know where to inject the HTML for a component to which we have been routed. It is synonymous with the old ui-router’s “ui-view”. I won’t bore you with the Home/About/Contact component template’s. These are all copy/paste versions of the original *.cshtml files. I haven’t put this project into a public Github repository yet, but will shortly.